When it comes to technology and venture investing, the Middle East hasn’t historically ranked as a top destination for companies looking to deploy capital. But a series of recent deals could be a sign that the nascent sector is finally coming of age. The first signs were in 2017, when U.S. e-commerce giant Amazon.com Inc. agreed to buy Souq.com, a Dubai-based online retailer little-known outside the region, for about $600 million. 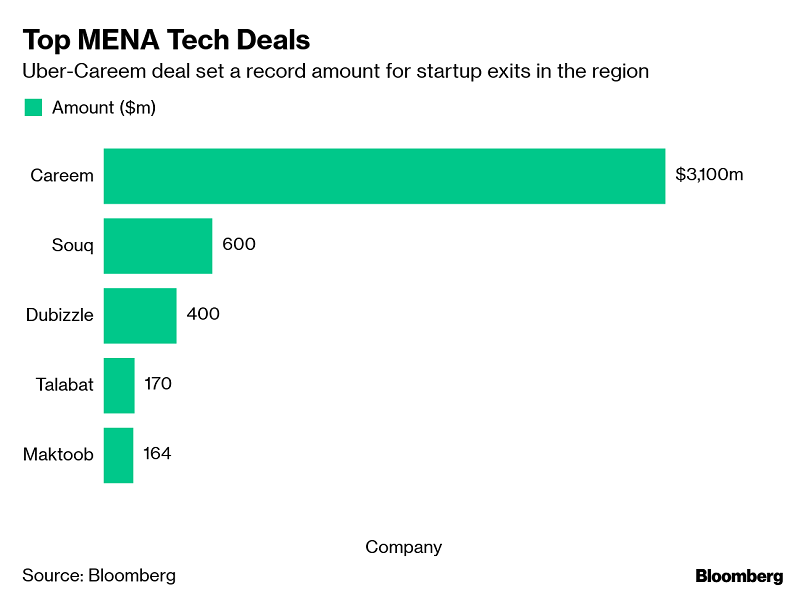 On Tuesday, the largest-ever tech deal in the region was struck as ride-hailing giant Uber Technologies Inc. agreed to acquire its regional competitor Careem Networks FZ for $3.1 billion in a cash and stock deal. Investors are expected to deploy more capital to the sector as they see the outcomes of companies such as Careem and Souq.com. The Middle East and North Africa region has a seen 30 to 50 percent increase in funding year-on-year in startups since 2015, according to Magnitt, a data platform for startups in the Middle East. Much of the region’s capital has flowed to the U.S. or Asia when looking for tech deals, as governments increasingly focus on diversifying away from oil-related economy. Saudi Arabia’s sovereign wealth fund and Mubadala Investment Co., the Abu Dhabi state fund are the largest outside investors in SoftBank Group Corp.’s $100 billion Vision Fund and more efforts are being taken to step up investments in the space. However, the Middle East is ripe for inward investment. It has a young and rising population of about 400 million who are increasingly leaning toward mobile phones and software applications to meet their consumer needs. Per capita income in some of the Gulf countries like Qatar and the UAE, are among the largest in the world. Mastercard Inc. joined the list of large U.S. corporates taking exposure in the region when it agreed a $300 million cornerstone investment in the planned initial public offering of Middle East payment processor Network International. South African investment firm Naspers Ltd took full control of UAE-based classifieds site Dubizzle earlier this year at a valuation of about $400 million. “We’ve seen more international investors enter the marketplace, more regional investors enter the asset class, and as startups mature, they’ve raised larger ticket sizes to further grow their businesses,” Magnitt Chief Executive Officer Philip Bahoshy said. Uber’s acquisition — its biggest ever — got the attention of many, explained Christopher Schroeder, a U.S. tech investor. “No doubt when an American tech juggernaut, in the early days of planning to go public, makes its largest acquisition in the Middle East — everyone is noticing,” he said.